Animal Farm + SXSW Yoga and Music Retreat: Tune In and Turn It Up! Indulge your senses in 7 luxurious days of yoga and music. Deepen your practice and take some time away to reconnect with your self, community and nature. Immerse yourself in the peaceful and nurturing environment of Animal Farm and take advantage of this amazing and unique opportunity… Dive deep into your yoga practice on a secluded, self-sustainable organic permaculture farm in South Central Texas. Nestled in a wild forest, Animal Farm creates the perfect setting for a yoga retreat. 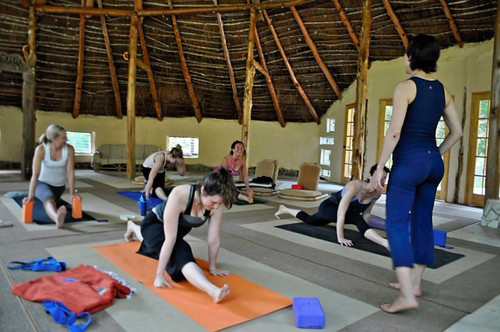 Yoga classes are conducted in a beautiful thatched roof center, hand-made with all natural materials. Nourish yourself with freshly harvested farm-to-table organic vegetarian feasts. Gita’s gourmet cooking is always a highlight at Animal Farm retreats. During your free time at Animal Farm, you can hike amidst 70 wooded acres, explore the flower and vegetable gardens, reflect in the Buddhist sculpture garden, or relax by the Gaudi-esque pool. Then, after 4 days, we’ll pack our bags and retreat to Austin for 4 days for the largest and world famous music festival in the world; SXSW. We’ll stay at Travaasa, the newest experiential resort and spa in Texas. Surrounded by the ancient live oaks and undulating hills of the Balcones Canyonlands Preserve, this resort embraces nature and is described as a Zen-like preserve for the soul. After a morning yoga class, explore Austin and the SXSW festival or stay on premises for spa pampering or a wide array of adventure or cultural activities. Don’t miss this once-in-a-lifetime chance to embark on this unique yoga and music adventure! The rest of the day is free for you to explore Austin and SXSW, pamper yourself at the spa or take advantage of the many on-site activities such as horse-back riding, archery, Texas two-step lessons and more. Includes airport pick-up and drop-off, all yoga classes and accommodations, all meals at Animal Farm and breakfast in Austin. You will be responsible for concert tickets and activities (Austin is filled with free music everywhere during the festival), lunch and dinner while in Austin. *Hotel taxes and service charge not included (approximately $80-$100) due last day of retreat. 3 nights accommodation at Travaasa, 3 buffet breakfasts, 3 2-hour morning yoga classes with Dana. Learn More about Austin Here and Here.